Merry Christmas, Laura. Hope you and your family have a great Christmas and surive the vacation with the kids home :-) See you soon in sunny southern California! I hope all is well. You’re in my thoughts and I’m here if you need anything. I love the new website! Sign me up for next year's conference. I already told the school I will NOT be there on the Thursday and Friday before Memorial Day. I can't wait! Sorry for the delay in my response... still figuring this site out. YES, our products are safe for children with autism. BUT if you have a child who has food allergies and you are concerned about exposure transdermally, we should verify the ingredients first as we are botanically - based. Some of our products have gluten as well. Does that answer your question? It's a great time to get started with ARBONNE as they have waived the $29 enrollment this month if you want to become a preferred client and save 20%+ on all your orders. . It was a nice 4th of July guess what Jordan is driving!!!! Oh man, my hair is turning gray fast. Say hi to Shawn and give your kids a big hug. HI Laura, I know it took me awhile to get on here. In fact...I didn't do it...the guy doing the site signed me in! Teri called Kim after AO and told her to tell me to watch myself because Deer, Fitzpatrick, Singer, Offit and the other hellspawn, friggin idiots were on AO causing trouble and she didn't want me to get irate and mean....so I thought it best to just NOT be on here. Oh well, they started it by adding me to the site, so now it's not my fault what happens....right? hope you, the hubby and the kids had a great 4th! 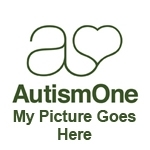 The AutismOne Convention goers were pleasantly surprised to have Jenny McCarthy on-site to sign autographs, take pictures and get to re-acquainted with friends from last year.